Just a quick post regarding Smertin. Although he has never really belonged to us I will still be sorry to lose him, especially now that the midfield options available at the club are looking so Spartan. The partnership he formed with Murphy earlier this season was the best we have had in the engine room for at least a couple of years, and although he hasn't quite been the same player since Danny left; I always feel more comfortable when he is in the middle than either Hughes or Holland. At the start of the season the partnership with Murphy was clearly the first choice. Now, if Smertin goes, both of those players will have left the club within 5 weeks of each other, and in both cases Charlton have been powerless to sign replacements. With both Thomas and Rommedahl seemingly unable to stay fit this term, the club is left with 3 other midfielders to choose from. Marcus Bent will be able to drop back to fill one of the midfield berths, but he is banned for our FA Cup adventure, so if we can't get the wingers fit we are going to be in serious trouble by the time the quarter final comes around. Lokomotiv president Valeri Filatov commented earlier in the week that "We're interested in signing Alexei Smertin, but only on certain terms. I've talked with Smertin and his agent but we haven't had talks with Charlton, so it's all still open to question". Why on Earth would he need to have talks with Charlton? We don't even own the player. Does this mean that we could veto any deal between Chelsea and Lokomotiv because the player is contracted to play for us on loan for the rest of the season? I was under the impression that there was no recall clause in this loan deal, just a clause to state that we couldn't field the player against Chelsea. Displaying my own ignorance, I didn't even realise that players could still be sold to other countries while our own transfer window is closed. Obviously they can in the case of Russian clubs, because Hibs are currently involved in a similar situation with their own player Gary O'Connor, who is also on his way to Lokomotiv Moscow after apparently walking out on the SPL side. I'm off for a night shift now. 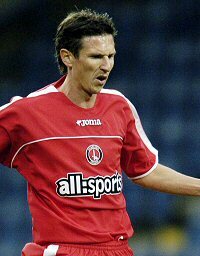 When I return home tomorrow morning I expect to find that Smertin is no longer a Charlton player. Whatever you think of the man's ability, there can be no denying that certain areas of our squad will look incredibly threadbare if he goes. In my opinion, we would be one serious injury away from a crisis. I foresee at least two midfield purchases from Curbs during the Summer. Yes, that doesn't help us now, but it will happen. Curbs could put out quite an attacking midfield if he would simply put Ambrose at the head of a diamond with Thomas and Rommedahl on the wings. Then put Kish as a dmid who stays home and breaks things up. If Rommedahl isn't going to be healthy, then get Sam back and run him out there. The problem with the diamond is purely and simply lack of bodies in the middle of the park. Kish is a trier, but he isn't good enough to hold the fort on his own. Neither Thomas, Rommedahl, or Ambrose will contribute enough tackles to that foursome.